Vanilla Cupcakes — What the Fruitcake?! Without a doubt, this recipe is my favourite vanilla sponge recipe. I don't think I have any reason to go dabbling around with other vanilla cake recipes 'cause I just love this one too much. It's buttery and moist and oh so heavenly. You can dress it up or down, use any frosting you like, add a little bit of zest to the batter, fill it with curd or jam or caramel or ganache or anything else you fancy. 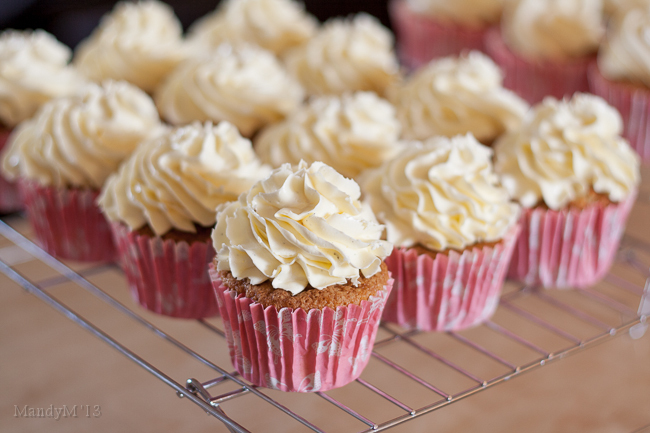 This vanilla sponge recipe is absolutely perfect for cupcakes. It is in fact the Magnolia's vanilla cupcake recipe. You can also bake this as a two layer 9" cake, I have yet to do so but I can imagine it would be fantastic! 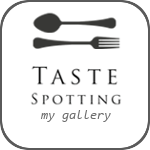 Why haven't I gone all crazy with flavour combinations for this post? Well, as the saying goes, Keep It Simple Stupid. So a big KISS it is. A big vanilla kiss! Perfectly sweet and moist vanilla sponge kissed with a generous swirl of velvety vanilla Swiss buttercream, and hiding inside, a white chocolate ganache centre. I'm just about swooning as I write this! And then we have the frosting. Again, it will take a lot to get me dabbling with other buttercreams! Ever since I discovered Swiss buttercream it's been one of my favourite frostings to use. 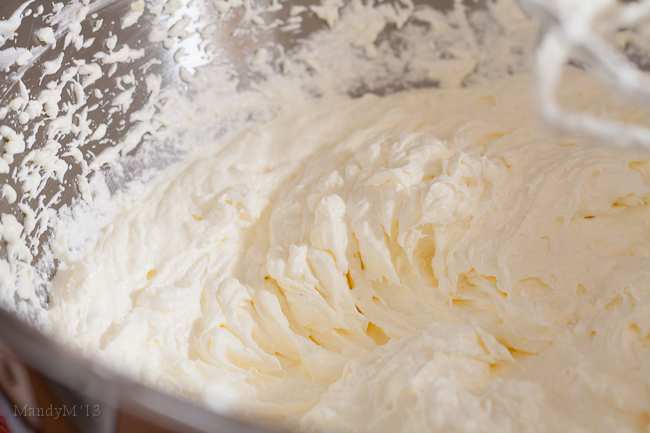 It's not as sweet as simple buttercream (icing sugar, butter, flavouring & cream or milk) and is far more creamy. It is a little bit more work than simple buttercream but it's well worth the effort. As for ganache, it's probably one of the easiest things to make and is also versatile. Warm it up and serve as a sauce with ice-cream. Firmer and you have the perfect filling for cupcakes, cakes and cookies or even use it as a frosting. It's only two ingredients, but again, sometimes the simple things are the best things. Using a large star tip, frost each cupcake with a generous swirl of Swiss buttercream then decorate with edible glitters, dragees, sprinkles, sugarpaste decorations, etc. Vanilla Cupcakes recipe adapted from "More from Magnolia"
Posted on February 1, 2011 by Mandy Mortimer and filed under Baked, Sweet and tagged Cupcake Swiss Buttercream Vanilla White Chocolate Ganache.